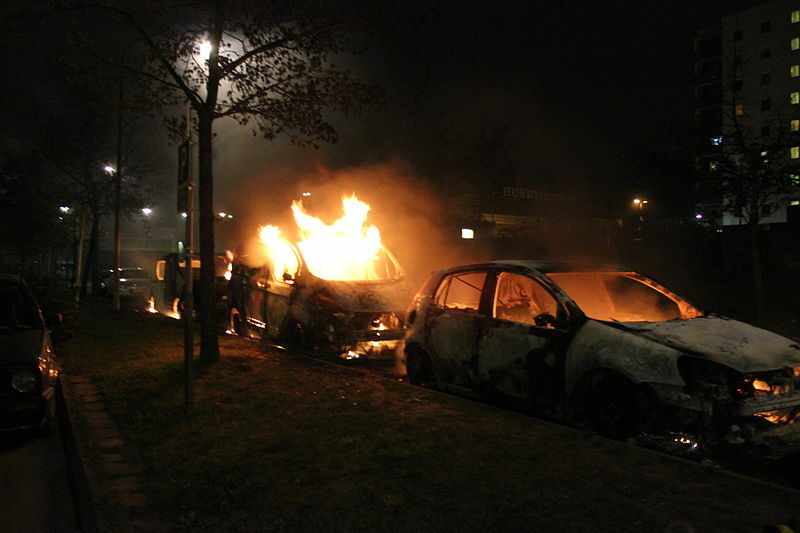 Cars burn during a second day of riots in Husby, a suburb of Stockholm. For many years, Sweden has welcomed people fleeing social and political unrest from all over the world, most recently exemplified by its reception of refugees from the civil war in Syria. Sweden has also drawn international acclaim for its focus and generous state support for immigrant integration programs. Its welfare state—one of the most generous in Europe—is a potential vehicle for promoting social cohesion among varied population groups. Given this, it is surprising that immigrant-origin youth participated in May 2013 riots across several Stockholm suburbs that have high proportions of foreign-born residents. Much of the news coverage and analysis explained the rioting by pointing to rising immigration in Sweden, as well as to the lower socioeconomic outcomes of Sweden's immigrants compared to the native population—and asked if the riots indicated a failure of immigrant integration. This article explores the underlying causes of the riots, and asks whether rapid increases in the size of Sweden's immigrant population or the government's integration efforts played a central role. The article finds that neither immigration flows nor integration efforts in themselves explain the riots, and a broader understanding of the economic and social context in Sweden is necessary to recognize the country's integration challenges. The first section discusses how the particular interaction of economic conditions, immigration policies and outcomes, and housing policies in Sweden created the underlying conditions for social malaise among immigrants and others that may have led to the riots. The second section discusses the government's new integration efforts, and explores the future prospects for immigrant integration in Sweden. Sweden is a country of 9.6 million people, with an industrialized and export-oriented economy. After World War II, Sweden began actively recruiting foreign labor as its export industry flourished, drawing many labor migrants from Finland, Germany, Greece, Italy, and the former Yugoslavia. The foreign-born workers received the same wages and rights as Swedes. Sweden's demographic profile changed substantially due to immigration beginning in the 1970s. After the 1973 oil crisis and global recession, the government halted labor migration from non-Nordic countries. New immigrants arrived on a much smaller scale, and were primarily comprised of people granted asylum on humanitarian grounds. Their origins reflected the political, religious, and social unrest in many countries around the world at this time. For instance, Sweden resettled 1,000 of the 70,000 expelled or stateless Ugandan Asians in 1972, as well as thousands of Chilean refugees following the coup against President Salvador Allende in 1973. The main countries of origin for immigrants to Sweden (from economic, humanitarian, and other streams) include Finland, Iraq, Poland, the former Yugoslavia, and Iran (see Table 1). Source: Statistics Sweden. Available online. Today, about one-fifth of Sweden's population has an immigrant background, defined as those who were either born abroad or born in Sweden to two immigrant parents. The foreign born comprised 15.4 percent of the Swedish population in 2012, up from 11.3 percent in 2000 and 9.2 percent in 1990 (see Figure 1). These proportions are comparable to those in some other European countries. For example, in 2011, 15.8 percent of the population of Austria was foreign born, as was 15.3 percent of the population in Belgium and 14.2 percent in Spain. For the entire European Union, however, only 6.5 percent of the population in 2011 was foreign born, in part because many Eastern European countries have significantly smaller proportions of foreign-born residents than elsewhere in Europe. Note: Data for the numbers of people who are Swedish-born with two foreign-born parents are not available before 2000. Source: Statistics Sweden, “Summary of Population Statistics, 1960-2012,” Available online. While Sweden's foreign-born population level is not an outlier, the country does stand out because a higher proportion of its immigration is humanitarian-based. Driven largely by a robust commitment to international protection and human rights, Sweden has consistently shouldered a disproportionate share of asylum seekers in the European Union. Of the estimated 331,975 asylum applicants registered in EU countries in 2012, 43,865 (or 13 percent) were in Sweden. Only Germany and France had higher numbers of registrations. Relative to its population, Sweden received the second-highest share of asylum applications in the European Union (after Malta). More than half of these applications were from Syrians, Somalis, Afghanis, Serbians, and Eritreans. Amidst escalating violence in their homeland, Syrians alone filed 7,814 applications for asylum in Sweden in 2012. Sweden's overall rate of positive decisions was 34 percent in 2012, compared to 28 percent in the European Union at large. Apart from asylum seekers, Sweden also has the largest and one of the oldest refugee resettlement programs in the European Union, dating back to 1950. Pursuant to this program, the Swedish Parliament establishes an annual refugee quota and designates funding for the resettlement of between 1,700 and 1,900 persons in need of protection each year. One town of about 80,000 people, Södertälje, since the mid-2000s has taken in more Iraqi refugees than the United States and Canada combined. Overall, from the1970s onward, humanitarian migration and family reunification have consistently outpaced all other forms of migration to Sweden. Except for movements from other EU countries, labor migration was an insignificant part of migration flows until 2008, when new legislation created an employer-driven labor immigration policy. The new system allows employers to recruit third-country nationals for jobs if they cannot find Swedes or EU nationals to fill the roles. As a result, labor migration has increased recently, but humanitarian and family reunification movements together still comprise the majority of Sweden's immigration flows. Sweden's immigration flows have occurred alongside significant economic changes over the past several decades—a situation that offers the underlying context of the May 2013 riots, which were touched off by accusations of police brutality when Swedish police killed a 69-year-old Portuguese immigrant living in Husby. The unrest quickly morphed into nearly a week of destructive acts by bands of young people, including youth with an immigrant background as well as far-right supporters who were upset over long-term youth unemployment and poverty. Unrest has flared up elsewhere in Sweden over the past decade, in areas such as Södertälje (2005), Malmö (2008), Rosengård (2010), and Rinkeby (2010). Sweden's economic successes were partly a result of some fundamental changes in its employment policies. Full employment had been a high priority before the 1990s—the government achieved near-full employment rates, with just 2 to 3 percent joblessness in the 1980s, which rose to 8 to 10 percent after the 1991 recession. While the post-recession macroeconomic reforms, such as reduced public expenditures and social transfers, helped the economy recover, they also meant that Swedes have since contended with higher rates of unemployment due to fewer public-sector jobs and increased privatization. In October 2013, the Swedish Labor Force Survey reported the unemployment rate at 7.3 percent, and at 18.9 percent for those ages 15 to 24. In the 2012-13 period, the unemployment rate ranged between 7 percent and 9.1 percent. While unemployment rates in Sweden after the 1990s have tended to be close to the average for Organization for Economic Cooperation and Development (OECD) countries, they still represent an adjustment for the Swedish people, who had become used to lower levels of joblessness. And higher unemployment rates have been a particular challenge to the Swedish social policy model, in which sustaining extensive welfare benefits depends on strong labor market participation. In addition to its employment outcomes, Sweden's labor market itself has changed over the past few decades. In part due to increased automation and efficiency, industrial-sector employment has been declining since the 1970s, while jobs in the service sector have increased. Alongside these changes, and perhaps as a result of them, Swedish society is becoming more unequal. Despite government policies that prioritize equality, income inequality in Sweden has been climbing steadily over the past two decades (although it is still well below the OECD average). On a scale between 0 and 1 (with 0 being perfect equality and 1 perfect inequality), Sweden's Gini coefficient in 2012 was 0.24, versus the OECD average of 0.31. Between the mid-1990s and late-2000s Sweden's Gini coefficient grew by 4.8 percentage points, representing one of the fastest growth rates in the OECD, and suggesting a likely driver of the growing discontent among the Swedish labor force—both native and migrant. In addition, the poverty rate in Sweden has more than doubled since 1995, and stood at about 9 percent in 2010, according to official estimates. Coupled with these macroeconomic changes, the largely humanitarian nature of immigrant arrivals since the 1970s has posed challenges of labor market integration for Sweden, as refugees often arrive with low levels of education and transferable skills, sometimes coupled with high levels of trauma. It must be noted, however, that in recent years, the education level of immigrants overall to Sweden has increased. Forty-four percent of immigrants who arrived after 2002 had some form of higher education, compared to 31 percent of those who arrived before 1991. A 2012 Statistics Sweden survey found that 39 percent of native Swedes and 38 percent of the foreign born had some level of postsecondary education. Nevertheless, high unemployment rates have disproportionately affected immigrant communities in Sweden. In 2009-10, Sweden had the highest gap between native and immigrant employment rates among OECD countries. Approximately 63 percent of immigrants were employed compared to 76 percent of the native-born population. This 13 percentage-point gap is significantly greater than the OECD average of about 3 percentage points. (See Figure 2.) Explanations for the gap include less work experience and domestic formal qualifications such as language skills among immigrants, and also the fact that a significant proportion of job opportunities in the Swedish labor market (two-thirds, by OECD estimates), are filled through informal means such as personal and professional networks. Among recent immigrants, defined as those who have been in the country for less than five years, the employment rate differed from that of the native born by more than 27 percentage points. In 2011, the Swedish newspaper Dagens Nyheter reported that 35 percent of the unemployed registered at the Swedish Public Employment Service were foreign born, up from 22 percent in 2005. Note: Recent immigrants are defined as those who have been in the country for less than five years. Source: Organization for Economic Cooperation and Development (OECD). 2012. Settling In: OECD Indicators of Immigrant Integration 2012. Figure 6.5. Available online. In addition to economic challenges, immigrants in Sweden also face a political and social backlash. Like many other European countries, Sweden has seen a rise in anti-immigrant politics over the years. Sweden Democrats (SD), a far-right party with a nationalist and anti-immigrant platform, crossed the thresholds for votes needed for parliamentary participation in 2010. Interestingly, and unlike elsewhere in Europe, mainstream parties largely opted not to work with the SD. And over the past five years, the number of hate crimes directed against Africans and the Roma climbed by 24 percent and 21 percent, respectively. A report by Sweden's United Nations Association and other organizations found that of the more than 5,000 hate crimes reported in 2012, about 74 percent were motivated by racism or xenophobia. So far, this analysis has covered the interaction of Sweden's immigration flows and its changing macroeconomic landscape. The country's economic changes helped it weather the global financial crises of the 1990s and today, but also changed labor market outcomes. Adding to this mix of factors that shape immigrant integration in Sweden has been the trajectory of housing policies and outcomes. As immigrant populations have grown, Sweden has experienced a persistent level of segregation—among the highest in Western Europe. In 2008, 60 percent of native Swedes lived in areas where the majority of the population was also Swedish, and 20 percent lived in areas that were virtually 100 percent Swedish. In contrast, 20 percent of Sweden's foreign born lived in areas where more than 40 percent of the population was also foreign born. Demographic differences among regions, and particularly between the north and the south of the country, are also important. The geographical segregation in housing has largely been the unintended consequence of Sweden's refugee resettlement efforts and its Miljonprogram (Million Program), an ambitious public housing program implemented by the Social Democrats in 1964 and again in 1974. The program's objective was to meet the growing demand for housing in urban areas, where 85 percent of the country's population lives, by constructing 1 million new homes over the span of a decade. Although these neighborhoods initially were home to large numbers of working-class Swedes, they now have high concentrations of immigrant-origin populations. In part, this is due to government housing policies that aimed to place new immigrant arrivals in available housing. Situated in the suburbs of major cities such as Stockholm, Göteborg, and Malmö, these neighborhoods have become known as betongförorter (concrete suburbs) or immigrant ghettos. Segregation between immigrants and natives is not unique to Sweden. Most European countries have examples of immigrant-origin minority groups living in high concentrations in urban areas, and in many cases, in public or social housing. At times—notably in Denmark and France—this outcome was a result of governments' earlier efforts to help immigrants by offering modern public housing. Segregated communities in themselves are not necessarily problematic, and living in an immigrant enclave may offer support to new arrivals who are just acclimating to a new country. However, if such areas are not transitional—and if multiple generations of immigrants feel as though they have no choice but to stay in them—ethnic enclaves can work against the interests of immigrants and the society that hosts them. Over time, people living in these socially segregated neighborhoods may risk increased marginalization or stigmatization in the broader society. Given the mix of factors that shape Sweden's immigrant integration outcomes, the government's policies for enhancing integration have also varied over the years. In 1965, long before immigrant integration was on the radar of most other European countries, the government established a task force to address immigrants' integration needs. Over the next several decades, integration efforts included funding for Swedish language courses as well as bilingual education, a system of public support for immigrant associations, a variety of anti-discrimination legislation, housing programs for new immigrants, and provisions for dual citizenship. Additionally, immigrants have been eligible for welfare benefits along with the native Swedish population. Most recently, government immigrant integration policies have focused on one main issue: employment. In 2008, the government implemented two substantial policy forms. First, a reform of immigrant admissions policies now allows labor migration from non-EU countries for the first time in decades, and ensures that over time, more immigrants who have needed skills will enter the Swedish economy. The policy aims to ensure that higher proportions of Sweden's immigrants are employed. Secondly, during the 2008-10 period, Swedish policymakers engaged in a serious rethinking of integration policy. The center-right Moderate Party, which has been the majority party since 2006, aims to “move from a hand-holding mentality where people from other countries have been considered weak individuals to a focus on people quickly finding a job,” according to Integration Minister Erik Ullenhag. In December 2010, Minister Ullenhag introduced a sweeping reform to the existing integration system, echoing changing approaches elsewhere in Europe. The central goal of Sweden's new integration policy is to get people into the labor market, as evidenced by the deliberate transfer of responsibility for integration to the Ministry of Employment. The policy mandates the government's employment service to counsel new immigrants and offer them coursework and training for up to two years, including language instruction through the Swedish for Immigrants program, civic orientation, and employment-preparation activities. In addition, benefits (administered by the Swedish Social Insurance Agency) have since been contingent upon individuals' active and full-time participation in these initiation and integration activities. Benefits include up to 308 SEK (around $50 based on September 2013 conversion rates) per weekday. Up to 4,500 SEK (around $700) in supplementary benefits for children are also available, as is a housing benefit of up to 3,900 SEK (around $600). Another major aspect of the reforms is the relocation of primary responsibility for integration from local municipalities to the Swedish Public Employment Service—effectively nationalizing integration. In the previous system, the national government offered municipalities financial incentives to accept new immigrants. While well-intentioned, the policy resulted in an untenable situation for both migrants and natives, as municipalities brought in new immigrants in order to gain funding from the government, but often did not have the jobs available to support the new residents. The latest reform allows the labor market to drive immigrant settlement patterns. Another new program subsidizes employers who take on immigrants as apprentices or interns, a system that allows the migrants to gain a foothold in employment, and allows employers to shoulder less risk and cost when they hire new migrants. Overall, the government is betting that a focus on building immigrant literacy and skills, and offering assistance navigating Sweden's labor market, will help other integration challenges as well. By targeting refugee populations with these programs, it is using employment policy to address Sweden's problems of integration and social inequality. Despite the government's recent policy interventions, the May riots reflect continued and deep discontent among Sweden's immigrant population. The discontent is fueled by the persistent difficulties that immigrants face, including increasing inequality, high unemployment—especially among the youth, experiences of discrimination, and a nativist political backlash. So far, the government has not responded by tempering its commitment to accepting refugees. For example, in response to the worsening Syrian refugee crisis, in September 2013 it announced that Syrians seeking asylum would be granted permanent residency. Instead, the government response has been to continue its commitment to its newly reformed integration policy. The key issues facing policymakers in coming years are determining the appropriate goals of this policy, and devising standards and measures to meaningfully assess integration success. Sweden's social model, which depends on high taxes and offers extensive welfare benefits to all residents, is premised on high levels of economic participation and a level of economic parity among residents. Robust efforts to bring non-economic migrants into the labor market reflect the government's strategy both for bettering integration outcomes and addressing the backlash against immigrants. The coming years will show if the country's new employment-focused integration policies serve as an effective response to Sweden's integration challenges. These policies will have to be implemented alongside other labor market reforms—for example, policies that make it easier for new workers, including both young people who are seeking their first jobs and newly arrived immigrants, to break into the labor market. Bitoulas, Alexandros. 2013. Asylum Applicants and First Instance Decisions on Asylum Applications: May 2013. Eurostat. Available online. Cerna, Lucie. 2012. Sweden. In Labour Shortages and Migration Policy, Anna Platonova and Giuliana Urso, eds. Brussels: International Organization for Migration. Available online. European Resettlement Network. 2012. Sweden: Facts and Figures. Available online. Eurostat. 2013. Asylum in the EU27: The Number of Asylum Applicants Registered in the EU27 Rose to More than 330 000 in 2012. Eurostat News Release 48/2013, March 22, 2013. Available online. ---. EU Member States Granted Protection to More than 100 000 Asylum Seekers in 2012. Eurostat News Release 96/2013, June 18, 2013. Available online. Försäkringskassan. 2013. Etableringsersättning (Introduction Benefit). Available online. Granestrand, Lasse. 2011. Utanförskapet skulle minska – så här blev det. Dagens Nyheter. November 26, 2011. Available online. Hammar, Tomas. 1985. European Immigration Policy: A Comparative Study. Cambridge: Cambridge University Press, 32-33. Lemaître, Georges. 2007. The Integration of Immigrants into the Labour Market: the Case of Sweden. Paris: Organization for Economic Cooperation and Development. Available online. Local, The. 2011. Poverty on the Rise Among Immigrants: Study. The Local. December 2, 2011.Available online. Organization for Economic Cooperation and Develoment (OECD). 2012. OECD Factbook 2011-2012: Economic, Environmental and Social Statistics. Available online. ---. 2012. Settling In: OECD Indicators of Immigrant Integration 2012. OECD Publishing.Available online. ---. 2013. Crisis Squeezes Income and Puts Pressure on Inequality and Poverty. New Results from the OECD Income Distribution Database. Available online. Regeringskansliet (Government Offices of Sweden). 1999. Regeringens proposition 1997/98:16. Sverige, framtiden och mångfalden - från invandrarpolitik till integrationspolitik. Available online. ---. 2013. Establishment Reform. Ministry of Employment. July 11, 2013. Available online. Simpson, Peter Vinthagen. Hate Crime Reports Decrease in Sweden. The Local. June 27, 2013.Available online. ---. 2010. 2010. Sweden Launches Integration Policy Reform. The Local. December 1, 2010.Available online. Statistics Sweden. 2013. Various tables. Available online. ---. 2013. Labour Force Survey (LFS). Various statistics. Available online. Swedish Migration Board. 2012. Asylum Decisions. Available online. Swedish Ministry of Integration and Gender Equality. 2009. Swedish Integration Policy. Government Offices of Sweden. Available online. Sofie Fredlund-Blomst is a candidate for Master of Arts in Law and Diplomacy at The Fletcher School of Tufts University. She is a former intern at MPI.